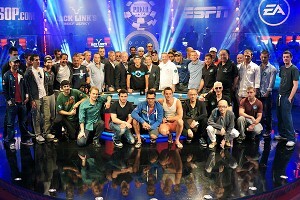 At the 2012 World Series of Poker a historic tournament took place. I know, that term is thrown around quite a bit and all of us poker writers are constantly pulling out our thesauruses to find words like historic, groundbreaking, monumental, revolutionary and momentous, but this time it was really the case! The $1,000,000 buy-in Big One for One Drop tournament captivated the poker world this summer, and in some ways trumped the WSOP Main Event, the previously untouchable “Most prestigious tournament in poker”. Now the WSOP, and One Drop founder Guy Laliberte are looking to build on the success of the inaugural event, announcing a second Big One for One Drop tournament which will take place at the 2014 WSOP tournament series. In between the WSOP will host a Little One for One Drop at the 2013 WSOP tournament series, which will feature a more modest buy-in of $1,100 and will be the first rebuy event at the WSOP since 2008. The question now becomes; can the WSOP and One Drop replicate the success of the this year’s event, where 48 players each put-up the $1,000,000 entrant’s fee, making the Big One for One Drop the largest first-place prize in the history of poker. The answer will likely depend on whether or not the tournament is tweaked, or if they decide to simply run the same event in 2014. Despite bringing the poker world to a standstill, the Big One for One Drop was not without its detractors, namely complaints over the absurdly top-heavy payout structure (and to a lesser extent the number of spots that were paid) as well as the player cap, which was set at 48, with several players turned away at the very end despite standing at the Rio cashier window with $1,000,000 in hand. During the announcement of the 2014 Big One for One Drop tournament, organizer Guy Laliberte stated that he wanted to break the record set this year, which means that the player cap will have to be raised or lifted entirely. This could be a problem as one of the main selling points to the wealthy businessmen that participated was that the field would not be overrun with top-tier tournament players, which led to many “amateurs” signing up for the event, which also led to many professional players feeling there was enough edge to warrant the hefty buy-in (of which $111,111 went to charity). Now the task will be to convince these same businessmen –as well as new ones—that the tournament will have the same feel as it did in 2012, even if the pros now outnumber them two or three to one, instead of the near one-t-one ratio in this year’s tournament. The idea of a 150 player field, where all of the pros have sold off major pieces of themselves will likely be unappealing to wealthy amateurs, so my best guess is that the cap will be raised to perhaps 64 players.